Cook the potatoes in a pot of boiling water for 10-12 minutes, or until tender. Drain and set aside. In a separate pot, cook the peas, broad beans and asparagus for 2-4 minutes. Drain and refresh under cold water. Whisk eggs in a large bowl. Add mint. Heat oil in a large non-stick frying pan over medium heat. Add the potatoes, peas, broad beans, asparagus and spring onion, cook for 3-4 minutes, or until mixture starts to brown. Turn the heat to low and pour the egg mixture over the vegetables and crumble over the feta and pepper. Cook for 10-12 minutes until mixture is almost set. Transfer the pan to the grill and cook for 3-5 minutes until the top is golden and cooked through. 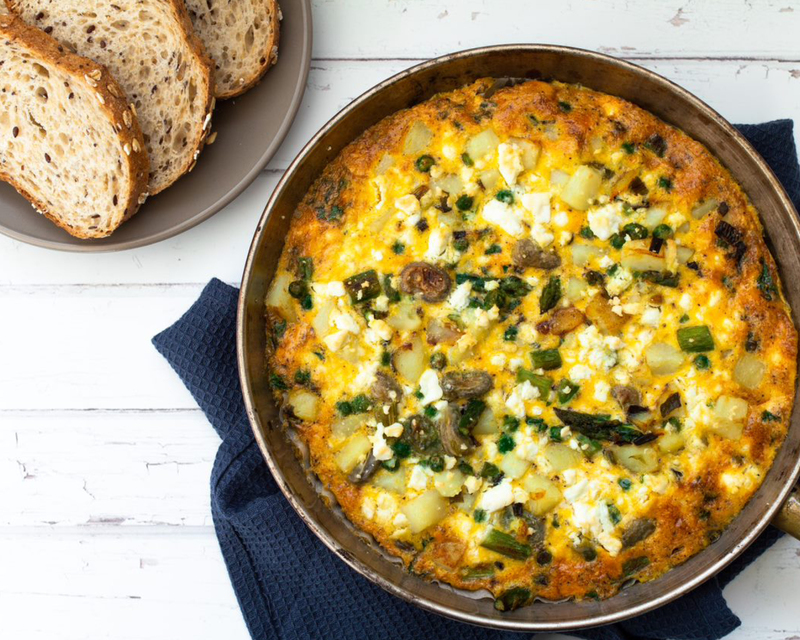 Slice frittata into wedges and serve with bread. Tip: This recipe can be made ahead of time and kept in the fridge for up to 3 days. It can also be frozen.